A new experience, especially something that has to do with work, isn’t much fun to me. Work could be fun sometimes, but as a sophomore in high school with tons of school work, maybe ‘fun’ isn’t the right word to describe the internship. To be honest, it is more like extra work, which means extra stress. However, despite the stress I received during my period of internship, I also learned many things - from both my colleagues and the UNICEF communication officers. 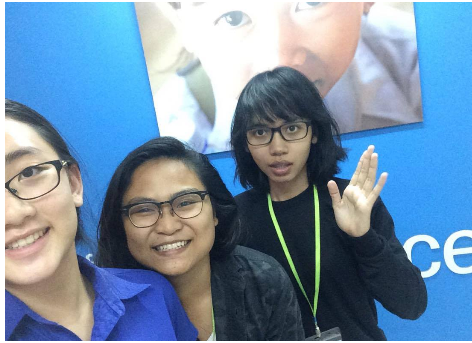 I came across this Local Voices of Youth UNICEF internship about 3 months ago on the UNICEF Cambodia Facebook page. After I told my parents, just like many other parents in the world, they were glad that I was going to apply for it. In fact, they REALLY wanted me to try it out. At first glance, I saw ‘writing’, which is probably not the best thing I would choose to do. I could say that I’m not a fan of writing whatsoever. The next thing I saw was that the internship would start on August the 1st. That was when I started panicking because my sophomore school year was going to start on August the 2nd. So, this made me think, ‘’Okay, maybe not this time, I wouldn’t want to already start to die on my first week of school.’’ After that, I shutdown my computer and went to have dinner with my family. I then told my parents that the internship starts a day before school starts but the response they gave me was, ‘’Do it anyways.’’ As a good and respectful daughter, I did it. In addition to my parents pushing me, I also knew that this internship would help me with my future scholarship and college applications. So, I submitted the application form, and wrote the mandatory essay with my free time. The first week was awesome - I got to meet my colleagues and the communication officers, who were also my lecturers for the entire internship. Since it was just the first week of school, finishing my first post wasn’t a big problem; I had time to go through all the comments and correct my mistakes. However, as days and weeks started to pass, work started to multiply. There would be work that were assigned on one day and due the next. After I finished one, I realized that there were two more that were due the same day. To add up, I also had to write essays, which aren’t my favorite. I came to a conclusion - high school life isn’t that easy after all. Despite the conclusion, I believe that this internship helped guide me towards the future. It helped me get a feel, even just a very tiny bit, of what working and job applications would look like in the future. Somehow, it taught me that time is very precious and it goes by super quickly - I can almost compare it with a snap. It reminded me to manage my time well, in exchange for a good sleep. Time management is very important in life; if not done well, the only result to be received is stress. Because of this internship, I developed my critical thinking skills, and thought more about world and local problems. Researching, asking myself and others questions, understanding; the internship has required me to do so. I’m proud to say that this internship made me do more research. That is totally not a bad thing, not at all - researching always earns me good knowledge or information that I haven’t known before. This internship did more than teaching me these skills- It introduced me to 4 other colleagues, which are amazing individuals. Since I was the youngest amongst all of us, they were like seniors to me. I learned to see problems and ideas from different perspectives. I even got to hear stories of their personal life. I still remember even before the internship started, I tried to add most of my colleagues on social media and chatted to them. My first impression of them was that they are nice and after the meetings and more chattings, they still remain the same as my first impression. I love making friends, and this internship gave me the chance to make even more friends, that at least we could know a bit about each other. My internship teachers - yes! How could I possibly forget them. Honestly speaking, I was frustrated whenever I reopened my document just to see ongoing comments about my mistakes. I thought, “Oh no! Not again,’’ but I knew I had to learn to correct them and they tried their best to assist me. They helped me make my writings sound better than what I started off with. They are great mentors - people who I could go to for help in the future. This internship journey was a rocky but also exciting road, totally something I would look back at. The workload created major stress, but taught me many things. I got to meet amazing people throughout the program, so I can’t wait for another opportunity like this.